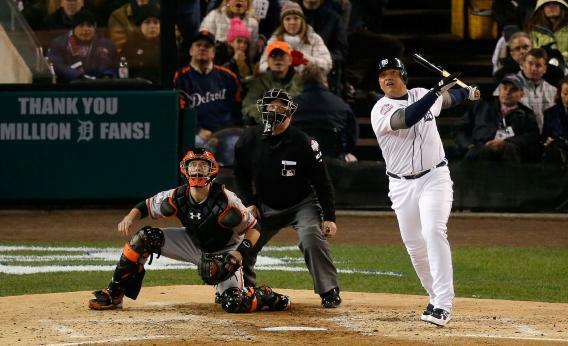 Miguel Cabrera is Mitt Romney: This time, the candidate of old white men won. Miguel Cabrera, the 2012 American League MVP. Photo by Leon Halip/Getty Images. Mitt Romney lost the popular vote. He lost the electoral college, too, finishing behind President Obama in every swing state but one. But the GOP nominee didn’t get crushed across the board. Sixty-two percent of white men voted for Romney, and 61 percent of white men and women 45 and older voted for the former Massachusetts governor. The problem for Romney wasn’t his opponent. It was the electorate. If he wanted to find a bloc of voters that was more susceptible to his charms, he should’ve announced his candidacy for another fiercely contested race: most valuable player of the American League. It is an argument enabled by the improved ability to measure different elements of the game—defense, base running, and situational hitting—that were once weak points of statistical analysis. Today, every stat matters. There is no end to the appetite for categories—from OBP to OPS to WAR. I mean, OMG! The number of triples hit while wearing a certain-colored underwear is probably being measured as we speak. … I mean, did you do the math? I didn’t. I like to actually see the sun once in a while. How about this? How about that? The fact is, voters are not instructed to give more credence to any one category than another. Twenty-eight sportswriters, two from each AL city, decide, in their own minds, what is “valuable” and who displayed it the most. In the end, memories were more powerful than microchips. As Silver lays out, the case for Trout is simple and rational: He’s a better overall player, which is clear if you look beyond traditional statistics. The case against Trout, and for Cabrera, is frothing and reactionary, dependent on willful distortions and self-parodically awful one-liners. (I mean, OMG!) Albom—who, like Silver, didn’t have an official vote for AL MVP—writes that he didn’t “do the math … [because] I like to actually see the sun once in a while.” This is not a sports column. It is a do-not-disturb sign. Albom has spent decades building up a thick layer of ignorance—how dare anyone try to disabuse him of it. Miguel Cabrera didn’t win the MVP because every baseball writer thinks like Mitch Albom. He won because almost every baseball writer who’s allowed to vote for the MVP thinks like Mitch Albom. The NL and AL MVP awards are decided by the Baseball Writers’ Association of America. The BBWAA selects two writers from each of the 16 National League and 14 American League cities to vote on each of its awards. Of the 28 BBWAA members who cast ballots for AL MVP this year, 27 are men and 26 are white. Women, African-Americans, and Latino tended to support Barack Obama in the presidential election. The three such voters in the MVP race, however, went for the older candidate: Susan Slusser, La Velle E. Neal III (who is black), and Mark Gonzales (who’s Latino) all voted Cabrera. But Cabrera was far from the choice of the new generation. In this election, the Triple Crown winner’s main constituency was old people in old media. Twenty-four of the MVP voters work for newspapers or newspaper groups; 21 of them (88 percent) voted for Cabrera. The remaining four are employed by websites and cable networks. Just one of them—ESPN’s Tim Kurkjian, who got his start in print in 1978—picked the Tigers’ third baseman. And based on my quick census, every voter 51 and above—that includes Kurkjian, Mark Whicker, Bob Dutton, Tom Gage, Sheldon Ocker, Bob Elliott, Daryl Van Schouwen, and several more—sided with Cabrera, the old-guard candidate. Among Trout’s six supporters were the shallow voting pool’s two relative youngsters: 32-year-old Jeff Passan of Yahoo and the Providence Journal’s Tim Britton, who graduated from Duke in 2009. Miguel Cabrera’s voters are ink-stained traditionalists who long for a time before nerds ruined baseball by explaining how it worked. Analysts who embrace modern statistical analysis—folks like Nate Silver, Dave Cameron, Jonah Keri and Keith Law—favored Trout over Cabrera in large numbers. In their in-house poll, for instance, the staff of Baseball Prospectus chose Trout as the AL MVP by a vote of 28 to 1. But who cares what those guys think? As of 2012, none of them get a vote. The BBWAA’s voting system empowers baseball’s most-conservative voices and disenfranchises those with non-prehistoric views. If presidential elections were decided this way, Mitt Romney would’ve won in a landslide, earning the support of the council of elders the nation had entrusted to make such a weighty decision: Charles Krauthammer, William Kristol, and George Will. Trout’s supporters should be heartened by the fact that this is one election where the winner doesn’t get any political capital. Cabrera—who declared on Thursday that he was worried he might lose because of “the new thing about computer stuff”—will not be empowered to ban advanced fielding metrics and make WAR illegal. Eventually, reason will win out over superstition, the conventional wisdom will change, and the nerds will become the establishment. The voters of 2012 will not decide who wins the MVP in 2032, and for that we can all be thankful. Thanks to Eric Goldwein for research assistance.